The Cloisters castle, right outside of Baltimore, is steeped in history and has a distinctly medieval vibe. Fun fact: It is actually where Will Smith and Jada Pinkett got married. They are marriage goals, right? This past May, it rained almost every single Saturday and this May Saturday was no exception. Kathryn and Arun took it all in stride and our team hustled in the rain to perfect their lush ceremony arch filled with greenery and spring blooms. 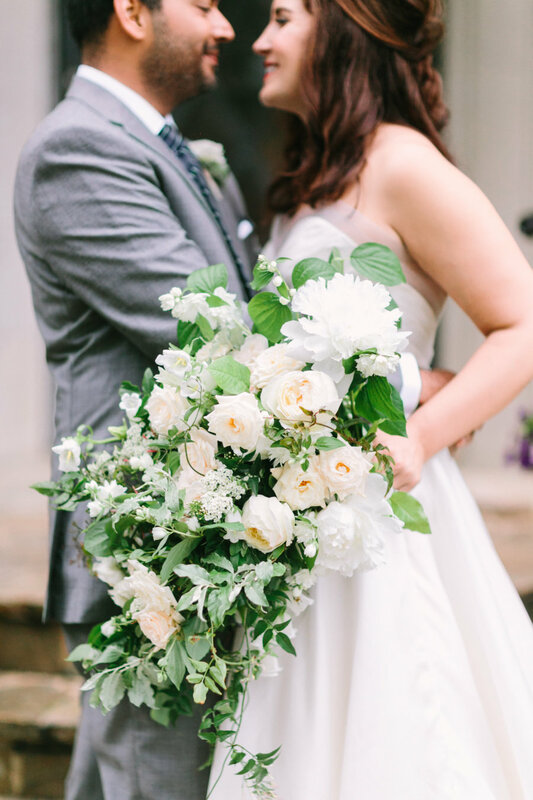 Spirea and campanula provided the perfect spring accents to Kathryn's cascading, asymmetrical bouquet filled with white peonies and fluffy garden roses. The couple gave us permission to go wild with the two mantle focal pieces and we had a blast designing and installing them. The reception space was filled with a lush garland of herbs and blooms and trailing candles for added romance.